Custom courses are completely flexible and simple to change to meet the needs of your program or students. It’s easy to edit a custom course if you need to update your information or add or remove cases and users assigned to your course at any time. After your course ends, please help keep your program’s course list current by removing your old courses after you have downloaded the reports you need. Note: Course reports always reflect the students and cases assigned as of the date you are accessing the report. You can edit any of the information that appears on the Courses page about a custom course (name, description, start date, end date, and person responsible) at any time. 1. 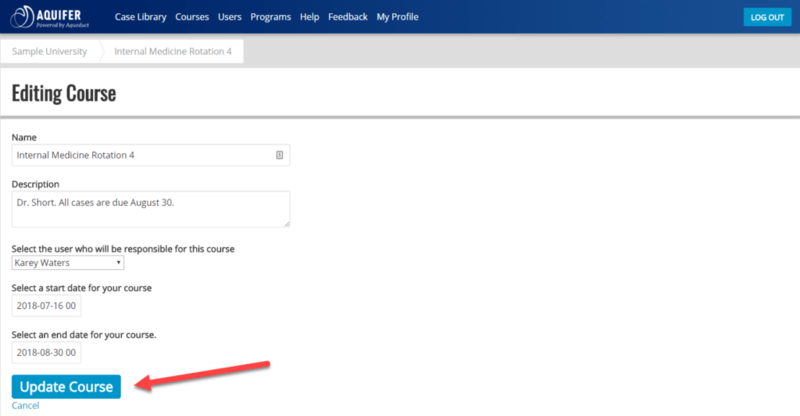 From the course page for the course you wish to edit, click the Edit button on the top right side. 2. Update the information you wish to change, and click Update Course. 1. Open your custom course and click Add Cases. 2. You’ll see a simple list of cases. Use the search field to type in case names to quickly find the cases you want to add, or scroll through the list of cases available to you. Click on the cases you want to add, or use the Select All Shown and Deselect All buttons to select your cases. 3. Click Add in the upper right-hand corner. After adding cases, you’ll return to your course page and will see the new cases added to the list. Note: To take advantage of the advanced case search to choose the cases you wish to include, we suggest opening the Case Library page (click on Case Library in the top navigation) in a separate tab to browse available cases. You can use the search and display features to make a list of the cases you wish to include, and then return to the Add Cases to Course page to select those cases and add them to your course. 1. From your custom course page, click Remove Cases. 2. You’ll see a simple list of the cases included in your course. Select the cases you wish to remove and click the Remove button in the upper right-hand corner. There are two options to add users to a custom course. Please see the Creating Custom Courses instructions for details. Removing users from a custom course will discontinue their access. Students who are removed will no longer appear in the course report. Be sure to download any needed reports before removing students. 1. From the course page, click Course Users. 2. Select the user/s you wish to remove from the course from the list. Use the search field to search by first name, last name, or email address to find your user/s quickly. 3. Click Remove Selected Users. 4. You will see a pop-up message asking if you are sure you want to remove the users. Click OK.
A confirmation message will appear in the light blue bar at the top of the page if your users were successfully removed. Help keep your program’s course list current by removing old custom courses. To help you manage this process, the person responsible for each custom course created after August 3, 2018 will receive an email notification when the course end date is reached asking them to extend the date or remove the course. Any user with the role of Program Service Administrator, Curriculum Administration, or Course Administrator can remove a course. Please be sure that ALL course users no longer need to access the course and all associated reporting before removing a course. To remove a course you—and all other course users—that no longer need to access, proceed through the steps below. 1. Be sure that you have downloaded and saved any reports that may be needed from this course. Reporting is not available for this course after it has been removed. 2. To remove a Custom Course, click on the course you want to remove. From the course page, click the Remove button on the right side. 3. You will receive a popup warning message. Click OK and the course will be deleted.